You've found the “U.S. Elizabeth Duck Breeders” page here at Hobby Farm Wisdom! If this is the first time you have visited our site: Welcome! 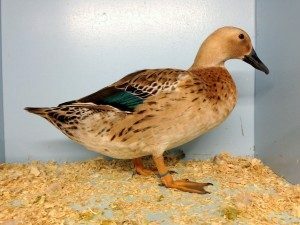 A domestic Australian breed, the Elizabeth ducks are a small, fast growing meat breed named after the wife of breeder Lance Ruting. Presently, they are only bred in Australia and New Zealand and are labeled as an endangered species in the Rare Breeds Trust of Australia. Their only color variety is a glossy green head ending in a white ring on the neck for the males, with a claret colored feather pattern ending in cream color, an off-white underbelly and dark grey feathers on the back with white rings. They have a solid black rump and black-brown tail. Females are fawn colored, showing brown markings on all of their feathers. Both genders they have grey bills, dark brown eyes and bronze legs. The drakes weigh 3.5-4 lbs and the females 2.75-3 lbs.